Jon Impemba is the Lead Site Producer and a Staff Writer at Fantasy Alarm. Week 1 of the NFL season is in the books. How did it go? Did you make it out unscathed or do you unfortunately find yourself in need of some reinforcements? Regardless of your situation, it never hurts to try and improve your team, and one of the best ways to do that is to attack the waiver wire and add the players who shined during Week 1 or will have new opportunities to contribute heading into Week 2 due to injuries. So, let’s take a look at the top players to target off the waiver wire heading into Week 2 of the fantasy football season. Tyrod Taylor, CLE — Taylor went largely overlooked by many fantasy owners heading into the season, as he had an average ADP of 116 across the major platforms. His ownership levels sit around 30 percent across standard leagues but is being used primarily as a backup on most rosters. Taylor had himself a decent fantasy performance in Week 1 against the Steelers as he threw for 197 yards with one touchdown and one interception while adding eight carries for 77 yards and a touchdown. 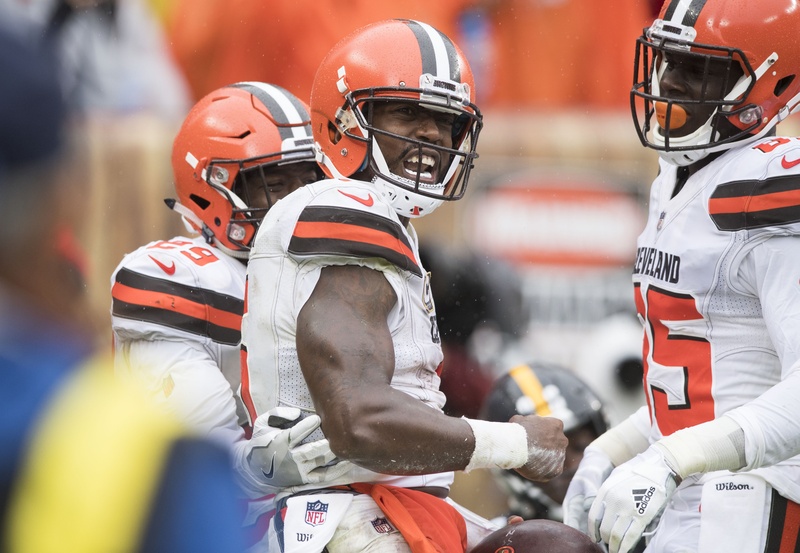 In Week 2 the Browns head on the road to face a Saints defense that just was torched by Ryan Fitzpatrick for 417 yards and four scores through the air and 12 carries for 36 yards and a touchdown on the ground. While Taylor might not have the same success, he certainly has the skills and the receiving group –Jarvis Landry, Josh Gordon and David Njoku — to do some damage if the Saints’ defense really is going to be bad this year. If you find yourself owning Marcus Mariota or Matt Ryan, you might be looking to upgrade heading into Week 2, and Taylor finds himself in what could be a real favorable matchup. Ryan Fitzpatrick, TB — For better or worse, Fitzpatrick is going to chuck. In Week 1 things could not have gone any better for the Harvard product, as he threw for 417 yards and four touchdowns while adding 36 yards and a touchdown rushing. Fitzpatrick completely 21-of-28 passes and averaged just under 14.9 yards per completion. There is no doubt the Buccaneers have big play receivers in Mike Evans and DeSean Jackson, who finished with 147 yards and 146 yards, respectively. Now the question is whether or not you can trust Fitzpatrick enough to start him in Week 2 against the defending-champion Philadelphia Eagles. Fitzy will have the benefit of the home crowd and a coach who is willing to let him throw. As I mentioned in the open, for better or worse, he is going to chuck. Last season he threw 30 or more passes in four of his five games. Fitzpatrick is not an every week starter, but if you need somebody to stream in Week 2, he has the weapons to be effective. 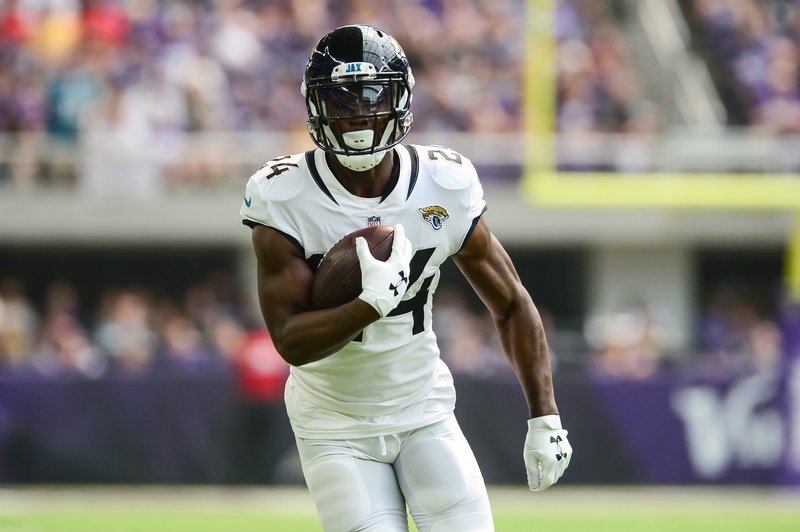 With that being said, the fantasy world turns their focus to Yeldon, who carried the ball 14 times for 51 yards while adding three catches on seven targets for 18 yards and a touchdown. The seven targets is something to note in PPR leagues, as Yeldon’s versatility if given the starting role will give him a higher upside than most. The Jaguars will be home in Week 2 against a Patriots defense that allowed 98 yards on the ground to Lamar Miller of the Texans to open the season. Phillip Lindsay, RB, DEN — I want to stress that you should never overreact to one week, especially if you find yourself with a favorable waiver wire position or FAAB budget to burn. With that said, it’s hard to ignore what Lindsay did against the Seahawks when absolutely nobody was expecting him to see the field — never mind out-touch Royce Freeman and take over as the No. 2 back over Devontae Booker. It’s possible Lindsay’s success was purely because the Seahawks weren’t expecting him to have a role either, but the man ran for 71 yards on 15 carries while adding two catches on three targets for 31 yards and a touchdown in the passing game. In PPR leagues, I definitely think he should be added, and while I doubt he overtakes Freeman for a significant role in the backfield, it at the very least looks like they will be splitting carries — with Freeman acting as the power back and Lindsay coming in as a change-of-pace option. 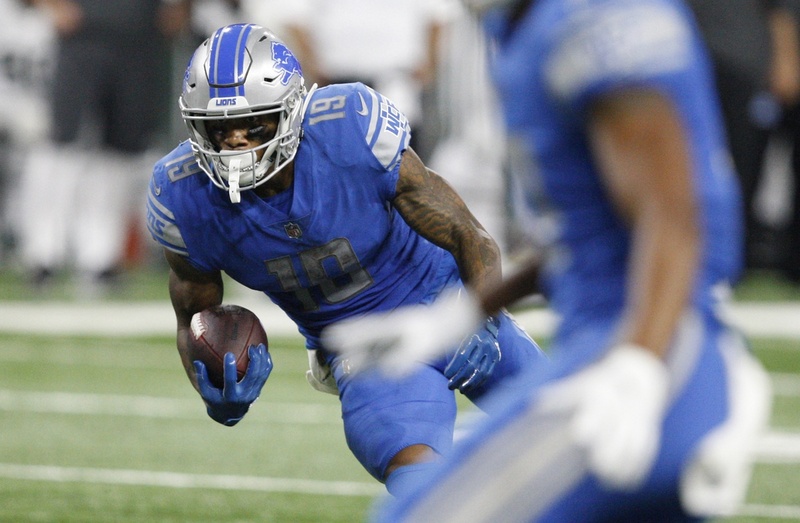 Kenny Golladay, DET — You couldn’t read a sleeper article this season without seeing Golladay’s name, yet he finds himself available in nearly 50 percent of standard leagues. That is going to change very quickly this week, however, after he dominated the Jets’ secondary for seven catches on 11 targets for 114 yards. Golladay was first in snaps and second in targets among the Detroit receivers. It’s worth noting he got some additional snaps and targets in garbage time after this game got away, but those numbers still count. I expect Golladay to be the top receiver added off waivers this week and, after a solid rookie year that saw him catch 28 passes for 477 yards and three touchdowns over 11 games, it looks like he could be in for a breakout season. Phillip Dorsett, NE — There is some short-term value here, as Julian Edelman is slated to return from his suspension heading into Week 5. Dorsett was Tom Brady’s top target among wide receivers in Week 1, catching all seven of his looks for 66 yards and a touchdown. He ranked third in targets overall behind James White (9) and Rob Gronkowski (8). Dorsett, a 2015 first-round pick, was acquired by New England last season in a trade that sent Jacoby Brissett to the Colts but barely had a role in the offense. With New England jettisoning Brandin Cooks to the Rams in a trade and Danny Amendola heading to the Dolphins in free agency, the team planned to utilize Dorsett in a bigger role in the offense and that held true during Week 1. Brandon Marshall, SEA –- News came out that Doug Baldwin has a slight MCL tear in his knee, which is going to cost him an undetermined amount of time. For Baldwin owners this is pretty tough news given his ADP and now the fact they will need to replace him on their roster. Luckily the replacement to target went undrafted by almost everybody, as Marshall is owned in about 5 percent of all standard leagues. Many were unsure if Marshall was going to make the team during the preseason, but he exits Week 1 with three catches on a team-leading six targets for 46 yards and a touchdown. Marshall has the size to play on the outside and be a top end zone threat for Russell Wilson. Many will look to Tyler Lockett as the team’s new No. 1 receiver and he too isn’t a bad option, but I worry about his size and the fact he has never been able to emerge as many had predicted in past seasons. In Week 2, Marshall has the revenge narrative of facing his former team in the Chicago Bears, where things did not end well. 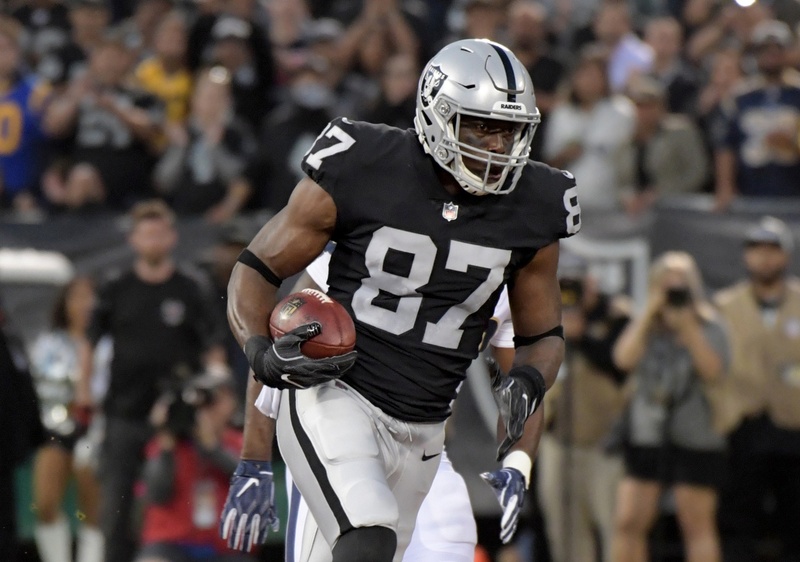 Jared Cook, OAK — So I’ll admit as I write this Cook has six catches on a team-high eight targets for 113 yards against the Rams, and that maybe has influenced his spot in this article. But if you have been paying attention to any of the news coming out of Raiders camp this preseason, you would have heard how much Gruden loves Cook and his fit in this new Raiders offense. Cook is a matchup nightmare for most teams given his size and speed, but he never truly has reached his ceiling as an elite fantasy tight end. However, if this game is an indication of how the Raiders plan to use Cook in their passing attack, he is a must add. His Week 2 matchup is also a juicy one as he faces a Broncos team that allowed 105 yards and a touchdown to Seahawks tight end Will Dissly in Week 1. Eric Ebron, IND — A healthy Andrew Luck is good news for all receiving targets in the Colts’ offense, and after hearing all offseason that the Colts intend to use both Ebron and Jack Doyle in their offense, we saw it on display in Week 1. Doyle had seven catches on 10 targets for 60 yards while Ebron had four catches on five targets for 51 yards and a score. Now, Ebron did finish fifth in targets, so it’s not as if Luck is locked in on him, but his size and athleticism makes him a legit end zone target for Luck when the Colts get into the red zone. In standard leagues, Ebron is going to need to find the end zone with consistently to reach any type of value, but if you are in PPR leagues or an injury happens to Doyle, he is safe to start on a week-to-week basis until we see him produce a dud or two. I am a promoter at DraftKings and am also an avid fan and user (my username is Riverseekerz) and may sometimes play on my personal account in the games that I offer advice on. Although I have expressed my personal view on the games and strategies above, they do not necessarily reflect the view(s) of DraftKings and I may also deploy different players and strategies than what I recommend above. I am not an employee of DraftKings and do not have access to any non-public information.